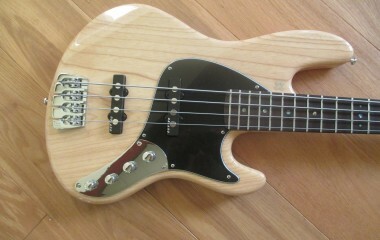 This is a fantastic bass and something different from Fender. It has a certain Musicman feel to it, with the oil finished back of the neck, the truss rod adjustment wheel at the neck heel and the powerful pick up. Not had one of these before….they’re very well regarded and a pro-level instrument. Dimension basses now take their place among Fender’s greatest bass designs as the modern pinnacle of pro-level bass style, power, performance and personality. The company that invented electric bass now brings you an elegantly original body style with all-new pickups, electronics and other fine features that let you sculpt and personalize your tone as no Fender bass ever has before. It is a level of bass artistry unparalleled in Fender history, and it is the future of your Fender bass experience. In every way, it’s an entirely new Dimension in Fender bass. The five-string American Deluxe Dimension Bass V is a phenomenal instrument, with an ash body in the completely new Dimension shape and featuring a comfortable asymmetrical neck heel. Its maple neck is crafted with a great-feeling asymmetrical “C”-shaped profile, Posiflex graphite neck support rods, a convenient heel-mount truss rod adjustment wheel, smooth hand-rubbed oil finish and five-bolt neck plate. The compound-radius (9.5”-14”) maple or rosewood fingerboard has 21 medium jumbo frets and a bone nut, while the headstock has a gloss finish and Stealth “A” string retainer.The instrument’s sonic sophistication is simply unmatched. Its single Dimension Bass humbucking pickup is both powerful and nuanced, and its 18-volt preamp, three-band active EQ (center-detented treble, mid and bass boost/cut) and master volume deliver remarkable tonal versatility with any degree of muscle and finesse. Other premium features include a three-ply parchment pickguard, knurled chrome control knobs, five-saddle Fender Hi-Mass bridge, vintage-style tuners with tapered shafts and a four-over/one-under configuration, locking strap buttons, side-mounted oval output jack and rear-mounted battery compartment.